The Madhya Pradesh High Court today, dismissed a Public Interest Litigation which prayed for revocation of Sachin Tendulkar's Bharat Ratna. V.K Naswah, the petitioner, in his petition had said that Tendulkar exploited the fame associated with the highest civilian award for earning money by endorsing commercial products and therefore it should be taken away. However, the Division bench of Justices Rajendra Menon and SK Gupta said such a petition is not maintainable. The High Court had admitted his plea on June 20th, this year. The petitioner, who appeared in person, before the Madhya Pradesh High Court Principal Seat at Jabalpur, also took exception to the reference to Tendulkar in a book as `Bharat Ratna Sachin Tendulkar', saying that Bharat Ratna was not a title. The court, dismissing the petition, advised the petitioner to approach Central Government with his demand. He told the reporters that he will approach the Central Government, and if they do not consider his request, he will move Supreme Court. 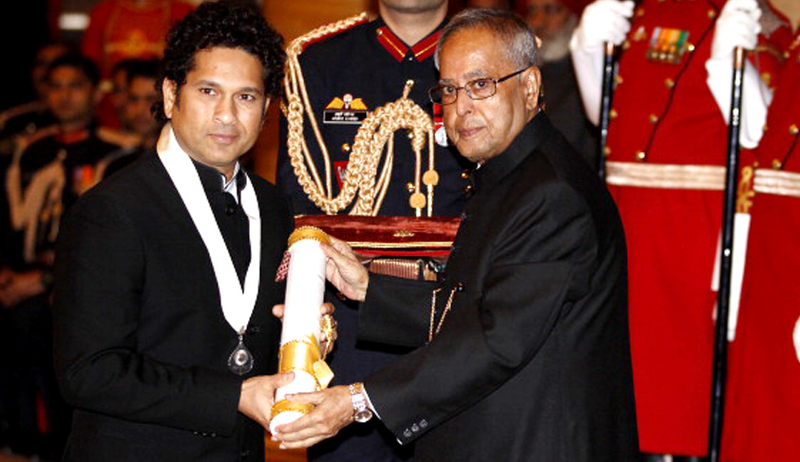 Bharat Ratna for the cricketing legend was announced on the last day of his cricketing career. He is the first sportsperson and also the youngest dignitary to be chosen for Bharat Ratna, the country's highest civilian award. Till 2011, Bharat Ratna was restricted to areas like "Art, Literature, Science and Public Service. But the Government seems to have changed the eligibility criteria and now it can be awarded for performance of highest order in any field of human endeavour. In terms of Article 18 (1) of the Constitution, the award cannot be used as a prefix or suffix to the recipient's name. But he is allowed to usethe expression like ‘Awarded Bharat Ratna by the President’ or ‘Recipient of Bharat Ratna Award in their biodata/letterhead/visiting card etc. In 1996, Supreme Court has held that Bharat Ratna and Padma awards are not "titles" within Article 18 of the Constitution of India.